I have an idea for a project using these flower designs I made weeks ago. Maybe I'll get to it tomorrow; we'll see. You have read this article design work with the title April 2009. You can bookmark this page URL http://jenkrebs.blogspot.com/2009/04/flowery-stuff.html. Thanks! 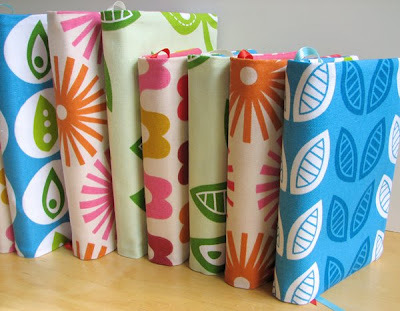 Some more fabric book covers are now listed in the Etsy shop. 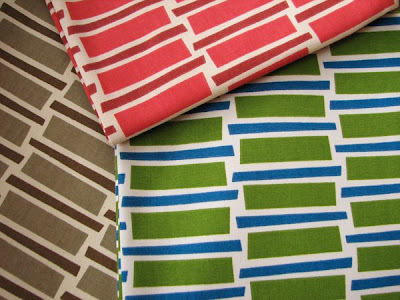 And we've got my new Amusement Park fabric from Braemore just in, so you can expect some bags and buckets and things in new prints soon. You have read this article with the title April 2009. You can bookmark this page URL http://jenkrebs.blogspot.com/2009/04/shop-update.html. Thanks! Here's a little typography quiz for you. You professional designers out there are going to pass with flying colors, guaranteed. You have read this article fonts / quizzes / time-wasters with the title April 2009. You can bookmark this page URL http://jenkrebs.blogspot.com/2009/04/quiz-name-that-font.html. Thanks! Some DIY tutorials. Knock yourselves out! You have read this article fabric / paper / sewing / tutorials with the title April 2009. 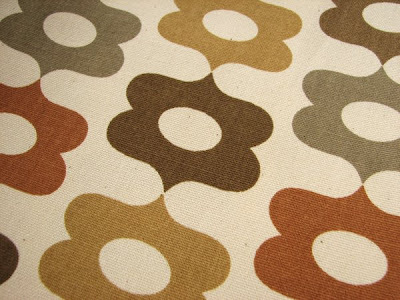 You can bookmark this page URL http://jenkrebs.blogspot.com/2009/04/projects-for-weekend.html. Thanks! 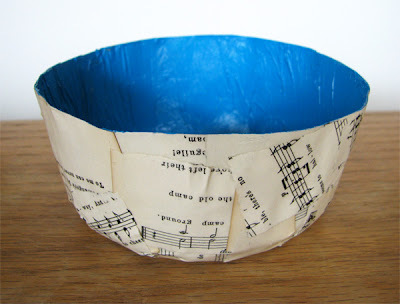 A little decoupaged bowl made out of songbook pages I found in the dumpster. Here's the how-to. 1. Get some paper (newspaper, scrap paper, packing paper, anything that's on the thinner side), Mod Podge or PVA glue, a bowl with a smooth bottom that will be your mold, and either plastic wrap or foil. 2. Wrap the outside of your bowl with the plastic wrap or foil. (Update: Having tried both now, foil is better.) Smooth it down as much as you can and fold the edges into the center of your bowl. 3. Rip up your paper into bits. 4. Flip your wrapped bowl upside down and set it on some sort stand, like a glass or jar. Coat both sides of each paper scrap with Mod Podge. (I dipped mine in the glue and used my fingers to smear it on.) Smooth each piece onto the outside of your bowl, overlapping the edges. (See here for pictures of the process on a similar project.) I kept adding paper until I had about 3 layers. 5. Wait for the bowl to dry. Mine took two or three days. Seriously. Wait until every last bit of glue showing through the plastic wrap dries clear. 6. 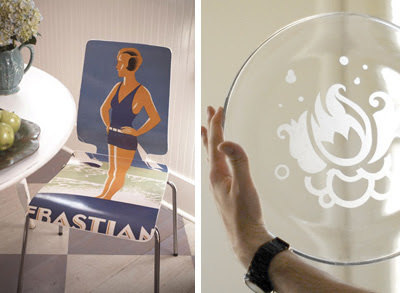 Freak out a little bit, wondering if you'll be able to pull your original bowl out of the paper. Pull the bowl out of the paper. Breathe a sigh of relief. Remove the plastic wrap. 7. Use a sharp scissors to trim off the rough edges of the bowl. 8. Paint if desired. I was just going to do just the inside, but decided to keep going. (Note: painting your vessel white will make it look like a creepy mummified bowl, so be prepared to add some decoration. I used a DecoColor paint pen to draw on a design. Please don't eat cereal out of your bowl and sue me when you get sick. It's not food safe! Use it for wrapped candy or keys or loose change. You have read this article paper / recycled / tutorials with the title April 2009. 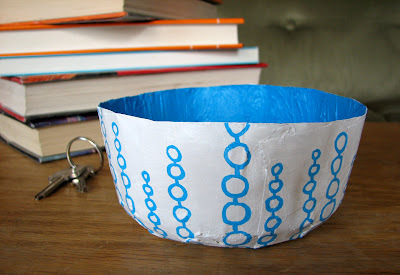 You can bookmark this page URL http://jenkrebs.blogspot.com/2009/04/mod-podged-paper-bowl.html. Thanks! A kind person emailed me a screenshot from Disney's Family Fun magazine so I could see this article in the May 2009 issue. A surprise! 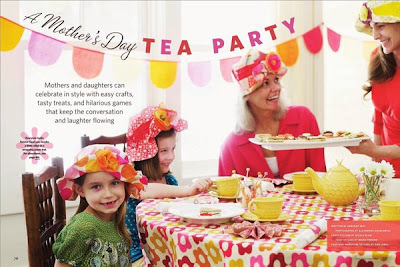 There's my fabric on the table, surrounded by crazy hats and cute girls. Who knew? You have read this article press with the title April 2009. 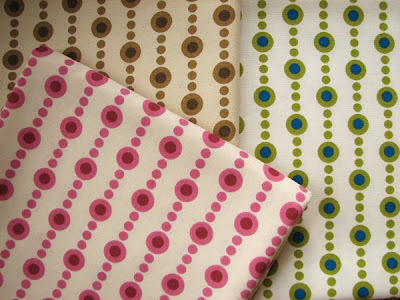 You can bookmark this page URL http://jenkrebs.blogspot.com/2009/04/calliope-fabric-as-tablecloth.html. Thanks! Download a fun little printable card from the talented Larissa Holland. It comes in a standard version and a jazzed up model. You have read this article cards / downloads / printable with the title April 2009. 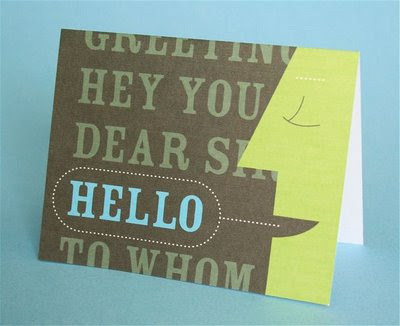 You can bookmark this page URL http://jenkrebs.blogspot.com/2009/04/hey-you-greeting-card.html. Thanks! 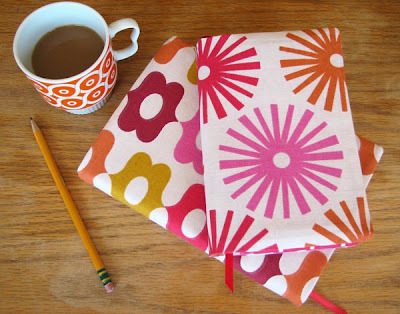 Reversible fabric book covers. Pair one with a good book for a unique Mother's Day gift, or keep nosy people from seeing what you're reading on the train. You have read this article shop with the title April 2009. You can bookmark this page URL http://jenkrebs.blogspot.com/2009/04/new-in-shop.html. Thanks! Lovely readers, maybe you can help me with this. A publication has requested some quality, high res photos of my Amusement Park fabric collection made into stuff, particularly for the home. Chairs, curtains, pillows, bags. The magazine would credit the photographer. 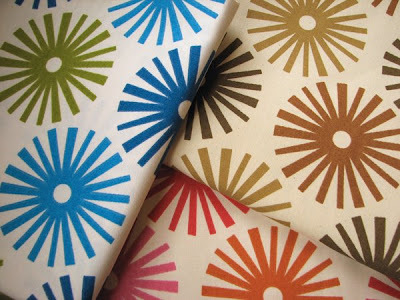 Since I don't really know where my fabric has gone out there in the world, it's hard to find pix. Has anyone seen (or taken) good shots? Thanks! You have read this article with the title April 2009. You can bookmark this page URL http://jenkrebs.blogspot.com/2009/04/need-photos.html. Thanks! 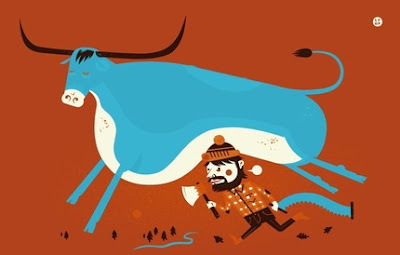 Paul Bunyan and Babe the Blue Ox arrived at my house via screenprint by The Little Friends of Printmaking. Aw, it reminds me of Minnesota, my home state. And it doesn't hurt that it's orange, too. Available here on Etsy. You have read this article favorite things / shop with the title April 2009. You can bookmark this page URL http://jenkrebs.blogspot.com/2009/04/everyone-needs-lumberjack.html. Thanks! Apparently I'm on a sewing kick, so in keeping with the theme, check out these free printable gift tags from doe-c-doe. They're scanned packages of vintage trims with the labels altered in Photoshop. 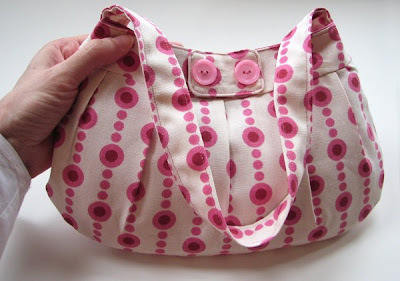 Something fun you can attach to gifts for your sewing friends. You have read this article downloads / paper / printable with the title April 2009. 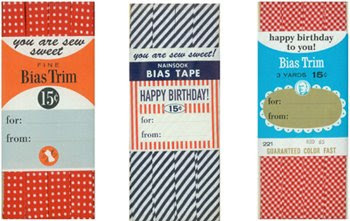 You can bookmark this page URL http://jenkrebs.blogspot.com/2009/04/vintage-trim-gift-tags.html. Thanks! 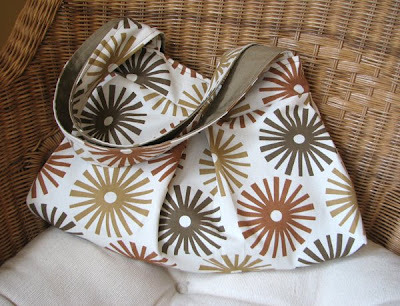 Yesterday I showed a friend the bag from the last post, and she said, "YOU made this? Are you feeling all right?" She's obviously aware that sewing makes me want to smash things. So get a load of this. I made another bag last night. Hell must be freezing over. 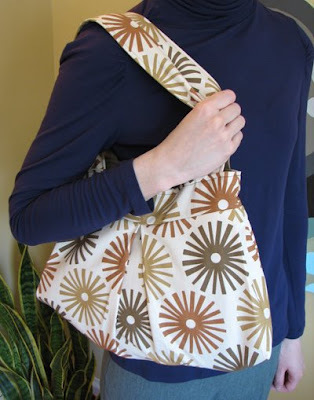 This one is from the adorable, free Buttercup Bag pattern from Made By Rae, with Beads fabric. And I didn't even bleed on it like usual. You have read this article fabric / sewing / tutorials with the title April 2009. You can bookmark this page URL http://jenkrebs.blogspot.com/2009/04/monday-sewing.html. Thanks! You have read this article fabric / sewing / tutorials with the title April 2009. You can bookmark this page URL http://jenkrebs.blogspot.com/2009/04/saturday-sewing.html. Thanks! You have read this article design work / fabric / shop with the title April 2009. 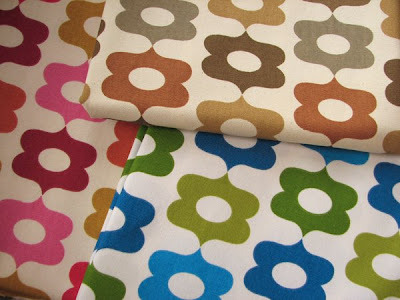 You can bookmark this page URL http://jenkrebs.blogspot.com/2009/04/new-fabric.html. Thanks! You have read this article cards / downloads / printable with the title April 2009. You can bookmark this page URL http://jenkrebs.blogspot.com/2009/04/printable-calling-cards.html. Thanks! You have read this article easter / fabric / origami / paper / printable / tutorials with the title April 2009. 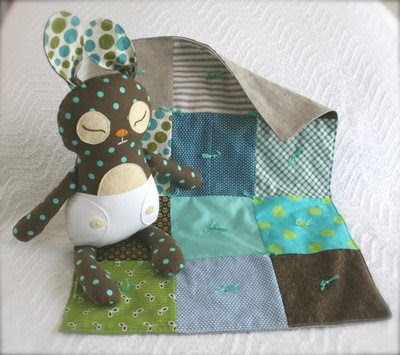 You can bookmark this page URL http://jenkrebs.blogspot.com/2009/04/easter-projects-you-can-make.html. Thanks! Thank you for all your warm birthday wishes last week! And to those who wondered if I'd be eating orange cake: YES. I stole this photo collage right off my friend Megan's blog so I could show you. Megan made graham cracker cookies with orange icing, Jamie made a chocolate orange marble cake, Michelle brought some amazing Ciao Bella blood orange sorbet, and Emery gave me the cutest orange card. I felt very celebrated by these dear friends. If you're interested in the recipes, clicking the names of the ladies will take you to their own posts with links. Thank you, everyone! You have read this article recipes with the title April 2009. 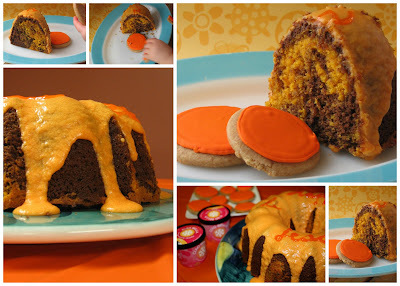 You can bookmark this page URL http://jenkrebs.blogspot.com/2009/04/orange-birthday-yumminess.html. Thanks! You have read this article with the title April 2009. You can bookmark this page URL http://jenkrebs.blogspot.com/2009/04/blog-post.html. Thanks!